Sometimes, people say something completely insensitive because they do not understand what they are talking about. Have you ever had a conversation with someone, and they offended you, but they didn’t even realize it? Chances are you aren’t being overly sensitive. They just cannot understand what you have gone through. If someone has never experienced something, like childbirth, then they tend to have preconceived notions on what it is like. Hearing a woman had a C-section instead of “delivering naturally” might seem like the lesser of two evils. It might even seem like a mother didn’t actually give birth to their baby. Which, quite frankly, is just plain wrong to suggest. Everyone is entitled to their opinion, but one new mom is hitting back at people who think having a C-section is “the easy way out.” There is absolutely nothing easy about a C-section. 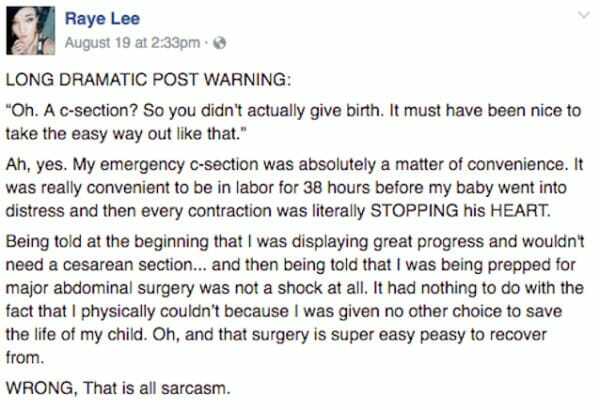 After being asked an ignorant question suggesting she didn’t really give birth to her son, Facebook user Raye Lee had quite the comeback. A C-section isn’t just the easy alternative to natural delivery. Doctors have to cut into the mother’s abdomen and uterus to extract the baby for many different reasons, like the distress Raye’s son was under. 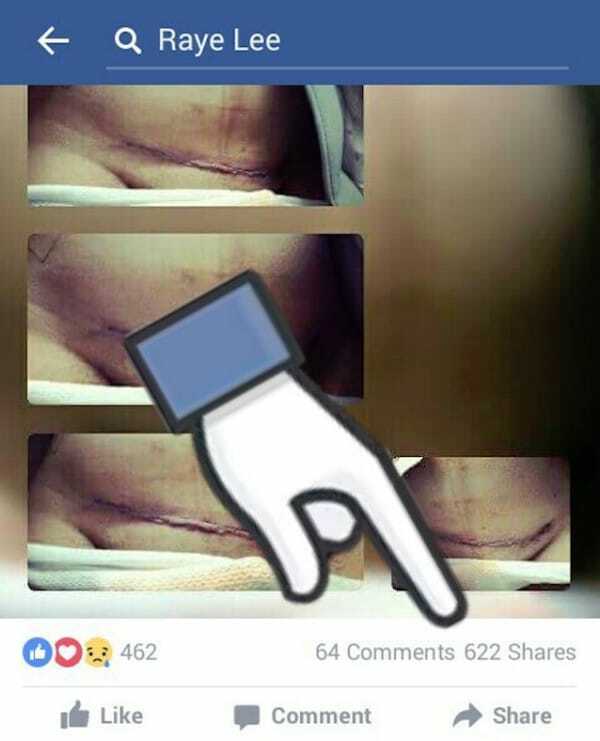 C-sections leave a large scar on a mother’s abdomen, but like Raye, most mothers wear their scars proudly as a reminder that they brought their child into this world. 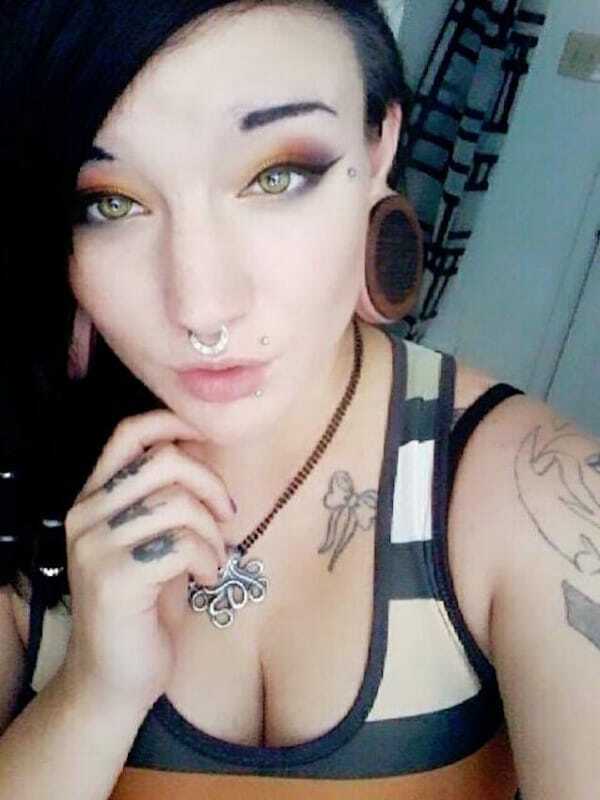 That doesn’t mean recovery from the surgery is anything easy. 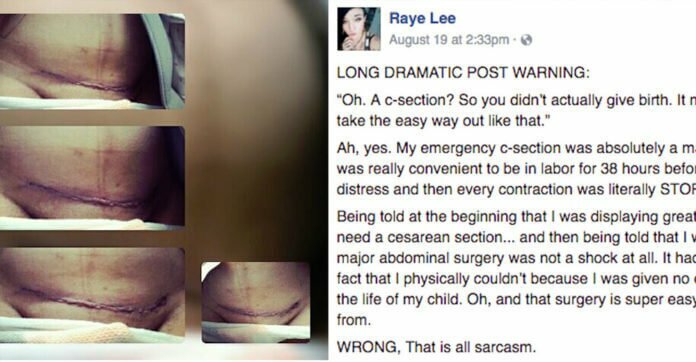 As Raye describes, the process for a C-section is not physically or emotionally pleasant. Afterward, moms are kept in the hospital for at least 2 to 3 days. They usually can’t even walk during that time, as the incision to the abdomen is so painful and takes a long time to heal. That first time getting out of bed is a horrible one. Raye’s brutally honest message about having a C-section and what life is like after has sparked a serious conversation. 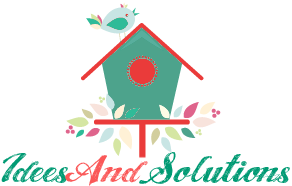 The Facebook post has received a ton of attention since being originally shared on August 19. It has been shared almost 7,000 times and has over 5,000 likes! Do you agree with Raye that there is nothing “easy” about C-sections? Don’t forget to SHARE Raye’s message with all of your friends and family!